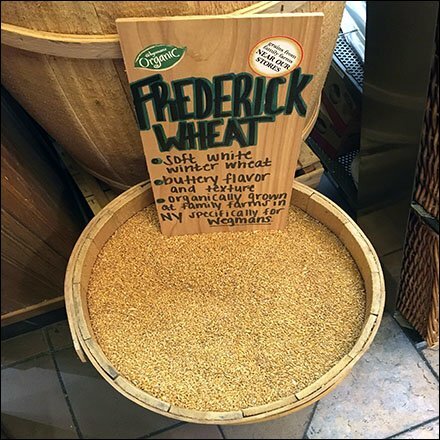 This Local Farm Organic Wheat By The Barrel is a rustic approach to merchandising. It does hint at the wholesomeness of an organic diet. A hand-lettered shingle as sign carries through on the effect. An “Organic” splat and “From Family Farms Near Our Stores” descriptor further define the offering. This Local Farm Organic Wheat By The Barrel approach seen at Wegmans. “ Barrels and Kegs in Retail Pinterest Board “ visual summary.